Theology: What’s So Special About Trinitarian Theology? Learning more about the nature of God has dominated my Bible study for the last decade. I find it to be more and more fascinating. Having the correct perspective of who God is cannot be overestimated. Viewing his sovereignty over eternity and the nature of his being orders all of our doctrinal understandings. The highest science, the loftiest spec­ulation, the mightiest philosophy, which can ever engage the attention of a child of God, is the name, the nature, the person, the work, the doings, and the existence of the great God whom he calls his Father. There is something exceedingly improving to the mind in a contemplation of the Divinity. It is a subject so vast, that all our thoughts are lost in its immensity; so deep, that our pride is drowned in its infinity. I am sometimes asked, “What’s so special about Trinitarian theology—don’t most orthodox churches believe in the Trinity?” Yes, they do. Belief in the Trinity is considered the hallmark of authentic Christian doctrine. It was our acceptance of the Trinity that brought our denomination “in out of the cold,” allowing us to break free from being considered a cult. As I studied what various churches believe about the Trinity, I observed that while most consent to the doctrine, it does not have a central role in their faith. Many consider the Trinity to be an abstract idea, of interest to theologians but not of much use to the rest of us. This is sad because when the Trinity is not at the center, shaping all other doctrines, strange ideas and distortions arise. For example, those who proclaim a health/wealth/prosperity gospel tend to view God as a divine “vending machine.” Others tend to view God as a mechanistic version of fate who has determined everything from before creation—including who will be saved and who will be damned. I find it hard to accept a God who creates billions of people just for the purpose of condemning and damning them for eternity! We know of this triune life of God from Jesus, who is God’s self-revelation in person. It should be our rule that anything we say about the Trinity must come from Jesus’ life, teaching, death, resurrection, ascension and promised return. I have seen many diagrams that attempt to explain the Trinity. The best of them fall short and some are confusing. It is impossible to explain the nature of God in a diagram. However, a good one can help us grasp some aspects of the doctrine. You may find helpful the diagram shown at right. It summarizes early church teaching, pointing out that correct biblical understanding concerning the nature of God upholds three essential beliefs about God. It also indicates that we end up denying that God is Triune when even one of these beliefs is rejected. Denial of the Three Persons results in Modalism (sometimes referred to as the Oneness teaching), the erroneous belief that God appears to us in three ways or modes, wears three hats, acts in three different roles or just has three different names. Denial of the Equality of Persons results in Subordinationism, the erroneous belief that one of the divine Persons is less than fully and truly God. 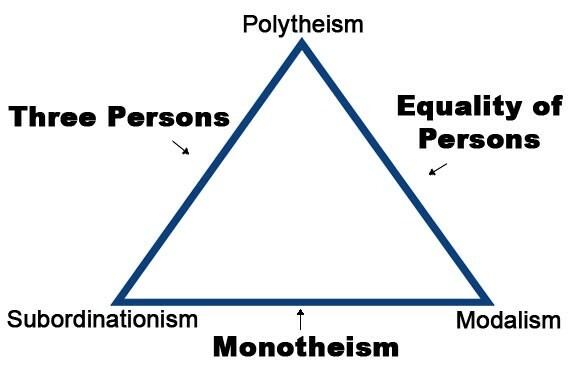 Denial of Monotheism (the idea of the Unity of God) results in Polytheism, the erroneous belief in two or more separate gods (including the error of tri-theism—a belief in three gods). When we are careful to uphold all three of these essential beliefs about God, we avoid the corresponding false teachings and thus bear faithful witness to the glorious mystery of the Trinity. I thank God daily for answering our many prayers to reveal to us greater truth. His revealing himself to each of us as the Triune God was a miraculous moment for each one of us.